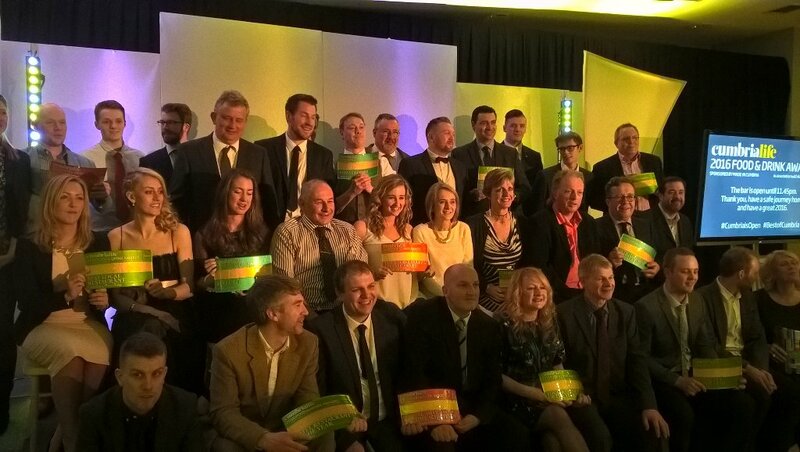 The prestigious Cumbria Life Food & Drink Awards took place last night (Thursday 3rd March) at Kendal College and were set to be the most competitive yet. Showcasing new Cumbrian businesses, as well as highlighting the increasingly high standards across the sector; with awards for the best restaurants, pubs, chefs, products and retailers. 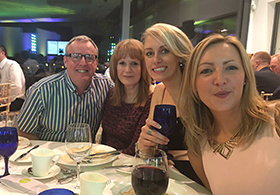 A delicious 3 course meal was served followed by Katy Cropper, 1st female winner of One Man & His Dog, star of Come Dine with Me, & fab Cumbrian celebrity hosting the awards ceremony. 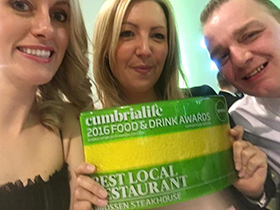 Brossen Steakhouse at our new four star Inn on the Square in Keswick was shortlisted for two awards; ‘Best Local Restaurant’ and ‘Best Newcomer’. Brossen opened it’s doors in June 2015 after undergoing a complete renovation which saw the hotel close for eight months. Once up and running we were awarded an AA Rosette just six weeks after opening and were over the moon to walk away last night with ‘Best Local Restaurant’ of the year award.